When it was announced in early 2010 that there would be an American version of Stieg Larsson’s The Girl with the Dragon Tattoo, eyebrows were raised and questions were asked. Was there any need for a Hollywood interpretation? Niels Arden Oplev’s Swedish adaptation was already making waves in the UK and US, winning over not only the critics but, most importantly, the box office, a rare feat for export cinema. It also held at its core a star-making performance by Noomi Rapace as its unconventional goth-hacker heroine Lisbeth Salander. Surely nobody else could place their own stamp on an already iconic character. Then David Fincher came aboard and everything quickly took a turn for the respectable. Cynics turned into hopers: perhaps this adaptation – note, adaptation, not remake – would deliver something more than the anticipated perfunctory fluff after all. Expectations were suddenly sky-high. No pressure, Finch. If Fincher did feel the strain, it certainly doesn’t show. From its pulsating opening credits, there is no doubt that we’re dealing with the antagonistic, uncompromising Fincher of the nineties as opposed to the (dare I say) more conventional director of The Social Network and The Case of Benjamin Button. Whether pounding the screen with blood and thunder violence or potently crafting suspense amidst an unnerving Scandinavian landscape, Fincher’s Dragon Tattoo is a nerve-jangling experience as he homes in on Larsson’s murder mystery and cranks it up to eleven. The plot, for those who have neither read the books nor seen the Swedish film, is two-fold. Disgraced journalist Mikael Blomkvist (Daniel Craig) is hired by billionaire Henrik Vanger (a superb Christopher Plummer) to uncover the 40 year old mystery of his niece Harriet’s disappearance, with all the clues pointing to a member of his own family or, as Henrik bitterly describes them, “the most detestable collection of people that you will ever meet”. 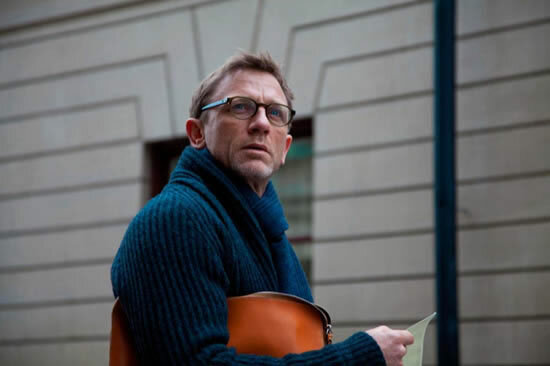 Craig does a fine job of playing novice-sleuth Blomkvist, embracing the character’s flaws and quirks to create a decidedly unmasculine, frequently awkward hero. Knocked down more times than he gets back up, James Bond, this is emphatically not. Of course, running parallel is the narrative of the eponymous Girl herself. Tattooed and pierced, hostile and abrupt, Lisbeth is one of the most, if not the most, atypical heroine in cinematic history. Harbouring a shadowy past and living in an equally dark present, Lisbeth (Rooney Mara) is used by all the men she comes into contact with, some more viciously than others, until hired by Blomkvist to assist him in his investigation. Though hard not to compare her to the intense and harrowing Rapace, Mara’s performance is more than worthy of its own accolades. More wraithlike and androgynous, her Salander is a shape-shifter, moving expertly from guise to guise. Unpredictable doesn’t quite do her justice, a sweet benefit for a film shadowed by previous incarnations. However, for all the trump cards this Dragon Tattoo seems to be holding, it doesn’t quite manage to iron out its predecessor’s flaws. Just like the Swedish version, the film occasionally falters with its epiphany moments, particularly, and most disappointingly, in its slightly altered conclusion, with the final twenty minutes feeling unnecessarily convoluted and a little flat in comparison to the sublime build-up. The film as whole, though, is a work of violent art, benefitting from the guidance of a director in as capricious a mood as his heroine. Put it this way, you’ll never be able to hear ‘Orinoco Flow’ in quite the same way again. Fincher’s Dragon Tattoo is a strange beast, not a remake but not of its own ilk either. Was it necessary for it to be made? No. Is it a good film? Undeniably. That might just be all that really matters.